Senior Preston Miglaw climbs up a local rock structure in Monterey. As the sunlight wanes on a Saturday evening, Jacob Johnsson is still scaling the homemade salmon ladder in his backyard. The Class of 2016 CHS graduate hangs from the bar on the third rung, prepping to jump a foot up to the fourth using only his upper body. If he learns how to conquer this, he is one step closer to achieving his goal: total victory on the world’s hardest obstacle course. Since it premiered in 2009, “American Ninja Warrior” has taken the nation by storm—the NBC-televised four-stage obstacle course competition has over 5 million weekly viewers, according to Nielsen ratings. The course contains unique obstacles, such as the salmon ladder Johnsson constructed in his backyard, which requires contestants to move a horizontal bar up a series of rungs, each a foot apart. With more than 70,000 applicants and training like Johnsson’s becoming more prevalent, the possibility that someone in our community could end up on the show is growing. With this in mind, the question has to be asked: Which Carmel athletes would fare the best in the competition? The Japan-originated competition is a test of strength, agility, balance and speed, with different obstacles catering to the different attributes. Due to the varied skill set, the field is typically dominated by free-runners and rock climbers—Isaac Caldiero, the only cash-prize winner to date, is an elite rock climber. 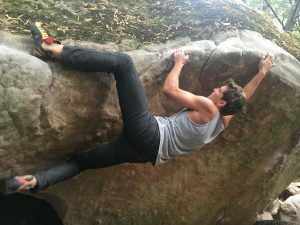 One of the brightest prospects is CHS senior and rock climbing enthusiast Preston Miglaw, who started climbing at Sanctuary Rock Gym in Sand City nearly two years ago, with “Ninja Warrior” in the back of his mind. The boulderer has surmounted climbs as difficult as V8, a challenge usually conquered only by those with years of experience. This upper-body strength could serve Miglaw well on obstacles such as the Ultimate Cliffhanger, a series of ledges just inches in width, which competitors must cross using only their fingertips as support. The untimed stage three is home to most of the difficult upper body obstacles, but to get there Miglaw would have to face the agility and speed-based stages one and two, featuring obstacles like the Warped Wall, a sloping 14-foot wall that competitors must run up. If Miglaw can beat that, he could have a bright career as an American Ninja. Agility is clearly key to a successful run to top the course, and agility certainly is no problem for junior Jake Dorn. Recently seen performing standing backflips at Powderpuff rallies, Dorn is a standout not only because of his background in parkour, but also his passion for the sport. “Ever since I was a little kid I wanted to be on ‘American Ninja Warrior,’” Dorn says. The varsity diver explains that he has tailored his workout regimen to better his chances at a run on the course. Dorn makes a strong case as the best all-around American Ninja in Carmel: He benches nearly his bodyweight, runs a 5:30 mile and does yoga for 20 minutes a day to improve body coordination. Dorn also has trampoline experience, which is helpful for obstacles like the jumping spider, where contestants must trampoline between two walls before making their way across. While they have not expressed the same interest in “American Ninja Warrior” as Dorn and Miglaw, some other students are well-equipped to handle the challenges of the competition. Junior Rashaan Ward showcased his agility and speed as a varsity receiver on Carmel’s football team this fall. As a sophomore, he ran an 11.87 100-meter dash and had a long jump of 17’9. This level of athleticism puts him on par with some the sport’s best. His dexterity is matched by his strength—Ward benches an impressive 170. Ward’s small stature may help him in the latter portion of the competition; in stage three, competitors must go through a stretch of four obstacles where their feet never touch the ground. Of course, it’s hard to overlook the impact women have had on the competition, most notably Kacy Catanzaro, the only woman to complete a city finals course, and Jessie Graff, the only woman to complete stage one. These athletes have served as an inspiration for women, bringing an influx of female competitors to the course. Senior Ilhara Gray is best to follow suit. Like Miglaw, Gray spends her time rock climbing, but focuses more on boulders outside the gym. She climbs a 5.11 for rope climbing and a V4 for bouldering. Upper-body obstacles usually serve as the bulwark for female competitors, but the common impediment is Gray’s strong suit. Although these athletes won’t be seen on the small screen any time soon—the age for eligibility to compete is 21—through drive, dedication and athletic ability, the prospects of today could be the ninja stars of tomorrow.